If you only read my blog here, you would think I had disappeared into the far reaches of Tasmania, but in fact, dear readers, I have been blogging twice a month at The Lipstick Chronicles, with a group of very entertaining and interesting women writers. I am posting there the first and third Friday of every month, and here are the opening paragraphs of the most recent three. Stop by! Three women, ranging in age from senior to ancient, are settled in a half circle at the end of the dock. The chairs have been dragged down to the pond from the main house, metal lawn chairs with green and white woven seats. My young son and I sit on the wooden slats of the dock. A little while ago, there were some bigger boys, young teenagers in baggy shorts and skinny chests, daring each other to swim in the murky water with snapping turtles and water snakes, but they’re gone now. is thick and still, so hot I find it hard to breathe, and my son’s pale cheeks are flushed. We are Colorado natives, and this is the countryside of the border between Missouri and Illinois. I’d rather be almost anywhere else. I hate fishing. I hate humidity. I hate the heat. Before we arrived, I’d been excited about this gathering with my husband’s family, but the reality is daunting. It’s hard to understand some of their deep south accents, and I don’t understand references to times and people I don’t know. And maybe they’re notpatronizing me, the much-younger, blond wife of an older African-American man, but all the usual in-law negotiations seem particularly exaggerated. Have you ever lived with a ghost? I have. In fact, I’m pretty sure she wanted me to save her house. My eldest son was in kindergarten when I first saw this house. It was a narrow, two story brick, with a bay window on the top floor, and deep porch. It was well over a hundred years old, and looked it—the yard was bare dirt, baked by the southwestern sun to absolute sterility, the paint on the old wood was peeling. There was a crack in the brick over one window. It was empty. Abandoned. But every day, as I passed by with my son’s five-year-old hand in mine, the house caught my eye. A pair of windows faced east, illuminating a staircase with a beautiful old banister, and spilling sunshine into the open front rooms. The light was so inviting, so peaceful, that often I would pause on the way back home and peer in the windows to see what else I could see. That inviting upstairs bedroom with the bay window. The enormous front windows overlooking the street, arched and ancient, the glass thin and wavery. One of them had a tiny bb hole in it. The kitchen was horrific—a single bank of cupboards made of tin, covered with wood-grain contact paper. My son was married on April 7. This means that I am a new mother-in-law. I have to forget everything I knew about mothering, and adopt a new approach. This is not the simple transition I imagined it would be. For one thing, the son who got married is my mama’s boy, a child so devoted to me as a baby that I called him my joey. He was two weeks late emerging from the womb, and then I carried him on my hip for the next ten months because he wouldn’t allow anyone else to so much as change a sock. He’d howl piteously even if it was his father. Writers for the Red Cross…a chance to bid on book-club-in-a-box! Time sensitive! Bids must be in by March 20! Writers for the Red Cross auctions are going on this month, and we can all see what an amazing job they are always doing, but even more so when something like an earthquake or tsunami wipes out cities. Help raise funds and get a How to Bake a Perfect Life package for your book club. Go to http://www.writersfortheredcross.org/baking-a-perfect-life-in-a-box/#respond to make a bid on a package that includes: 5 signed copies of How to Bake a Perfect Life, a celebratory signed apron, a sourdough crock and starter yeast, a collection of colorful spatulas, and a handwritten collection of the author’s favorite bread recipes. You may not know that I blog regularly in several other places. One of them is at The Lipstick Chronicles, every other Friday (alternating with such luminaries as Joshilyn Jackson and Diane Chamberlain). This morning, I have posted a story of my grandmother, a garden we grew, and my hatred of rhubarb. Don’t miss the recipe for rhubarb pie in the comments. I also blog regularly on random topics at my long-time blog, A Writer Afoot, where I write about travel, gardens, food, books, writing….pretty much everything. Here is a recent post about the urban farm we’re putting the backyard this summer: An Organic Farm! Also, I am aware of the slow speed of these pages. We’re working on it–seems to be a hosting issue. Stay tuned. I had an aggravating day yesterday and decided I wanted something soothing and delicious for supper. There was a whole chicken in the fridge, so I took it out, washed it, and threw it in a big pot. You can do the same. Put everything into a big pot and heat to boiling, then cover pot and turn the heat down to medium low. Let simmer, stirring occasionally, for three or four hours. You might need to add water several times. When it is time to make the dumplings, take the chicken out of the liquid and set it aside for a moment. Strain the broth to remove most of the big pieces of vegetables and peppercorns, then put it back in the pot and heat to a gentle simmer. Take the chicken off the bones and put the meat in the broth. Let simmer. Make the dumplings. This is not a difficult process at all, so don’t–as I once did–let it intimidate you. Dumplings are just biscuits. It’s the broth that makes them taste so good. Mix dry ingredients, then cut in butter. Add milk, stirring only until a soft dough forms. Drop by the tablespoonful into the simmering broth, cover and let steam for 10 minutes. Take one dumpling out and test it by cutting it open–it should be as fluffy as a biscuit inside. If not, let steam a little longer. Serve in soup bowls. Could probably cure almost anything. OMG OMG OMG. That bread is soooooo good I could prolly eat the whole thing!!! I can’t promise you will like it as much as she does, but it’s one of my favorites, too. It would be an excellent offering at a book club. Sometimes a recipe is born from a moment, and this is the recipe that I came up with after my first night with Jonah. Filled with light and juice and tenderness, it is one of my favorite things. Try it with a cup of sweet chai. Welsh Rabbit, which I thought for years was Rarebit, no idea why, and is only cheese and toast. How simple and lovely is that? Roast beef with Yorkshire pudding, served bloody rare, which I loathe. 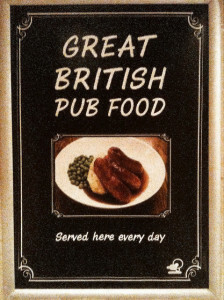 Not a fan of roast beef, though I love the gravy, and that gravy is a wonder with Yorkshire puddings. Beef and Guinness pie . I once made this recipe, or one quite similar and forgot that I had it in the oven (before the crust was on it). It cooked at 300 for a couple of hours and the flavors were as deep and rich as some precious old wine. Highly recommended. But my favorite thing about British food: cheese, cheese, cheese, cheese, cheese. Check out these 9 artisan cheeses. 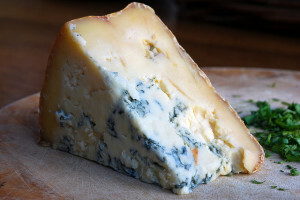 But don’t forget Stilton or Wensleydale with cranberries or mangos or some other something. They’re all great. What foreign foods do you love? Have you even fallen in love with something in a far away land? My publisher had a few of these aprons made for How to Bake a Perfect Life. You can win one of them (autographed if you like) by simply posting a response here on this page (or on Facebook). Also available as an ebook for Kindle, and Nook and other formats. How to Bake a Perfect Life will be in stores in 4 short days (Tuesday! ), and in honor of that date, I’m going to start giving things away. This is the first one, a sourdough crock and either fresh or dried (you choose) starter from King Arthur flour. To win, just post to the comments and I’ll draw a name tomorrow morning.